I'm reading This Is Not a Love Story: A Memoir, by Judy Brown. It's wonderful. The author writes about her upbringing in an Orthodox Jewish community. Two major things happen: one of her siblings is born "crazy" (actually autistic), and her parents fall in love with each other (scandalous in their pious world of arranged marriages). Young Judy questions, prays and makes deals with God to help her family. I really like her writing and the ways she describes her childish thinking as these situations unfold. I'm very interested in insular religious communities, and as you know, I adore memoir. This book really spoke to me; the positive review from Nina Stibbe on the back cover didn't hurt either. I'd read just about anything she told me to. The idea for a perfect border will come to you at 3:00 am. That is what always happens to me. I bet it will be left no matter what. pretty blanket and edgings do make the project don't they? I have been faffing with the border of my last blanket for almost a month now! Your Hensfoot blanket wasn't really to my taste, and then I saw this weeks picture and realised that I had fallen hopelessly in love! Really looking forward to seeing your decision on the border. The blanket really is looking pretty, the colours are a delight. The books sounds just my thing, I must look into it. I think the colors are incredibly highlighted on your blanket, it's really pretty! Your blanket looks well but will definitely need a border. It will be fun trying to work out the best one to use. Borders really do finish off a blanket nicely. I just added that book to my Goodreads. I look forward to reading it. I think you are going to enjoy choosing and working the border. 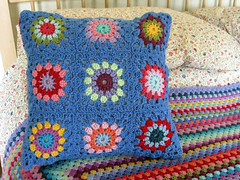 Crochet blankets really need a good frame to show off the middle. Another good book recommendation from you Jennifer, thank you. I've just begun reading "A Natural Curiousity" by Margaret Drabble, who is one of my favourite mid-late 20th century authors. 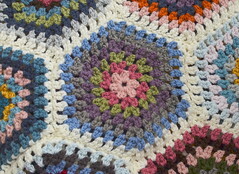 Blankets really do look best with borders, but they can be very tedious to do! I must check out that book. I sounds fascinating! Being a bit of a border-phobe I'm looking forward to seeing what you do, too. The colors in your blanket seem both old-timey and, at the same time, fresh. What a pretty thing to have to work on. And I agree...the book sounds very interesting. 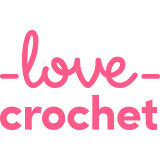 My crochet practice is temporarily suspended due to a strained wrist. I've just finished reading a book that Nina Stibbe put on her IG feed. Honestly, I think I'd read the back of a cereal packet if she told me too. She lives a mere 30 miles away from me. I'm star struck from not so afar! I hope you work out your border conundrum, worrying about these things is what we do isn't it even tho we know that the solution will come to us. I really like that blanket! The book sounds very interesing. The book sounds really interesting. Your Hensfoot is coming along very nicely and I'm looking forward to seeing what you do with the border. Your blanket is so pretty, Jennifer. I would be intimidated about having to put a border around such a large piece, but maybe with crochet it isn't as tedious as knitting. Thanks for the book recommendation. My poor Kindle is groaning under the weight of all the books I have on it, but then I see another good one like this and can't resist adding it.